Remember when iTunes used to be about playing music? It's evolved into a mess of an app for selling Apple's media services. I’ve never flown a commercial airliner, not even in a flight simulator, but I imagine it’s pretty similar to operating the latest version of iTunes. There are so many buttons, so many menus and menu items, that understanding what iTunes does has become extremely difficult. I understand that you can do a lot with iTunes (yeah, I know, you may say it’s “bloated;” I disagree), but it’s so far beyond “intuitive,” that average users hunt and peck to try and get things to work, and many just give up. Even I, who write Macworld’s Ask the iTunes Guy column, have gotten confused by many of the changes in the latest version of iTunes. When iTunes 12 was released, one of the main interface changes was a new set of buttons in the center of the window. These buttons, together with the media library buttons at the top left of the iTunes window, work together, meaning that each of the buttons of one group is a state of each of the buttons of another group. You can’t do things simply in iTunes any more. Instead of enjoying our music, we’re stuck in an endless loop of trying to learn new features. So, if you’re in your Music library, and you click iTunes Store, and then want to go to your Movies library, you click its icon at the top left. But you remain in the iTunes Store, in its Movies section; you need to click another button to get back to your library. 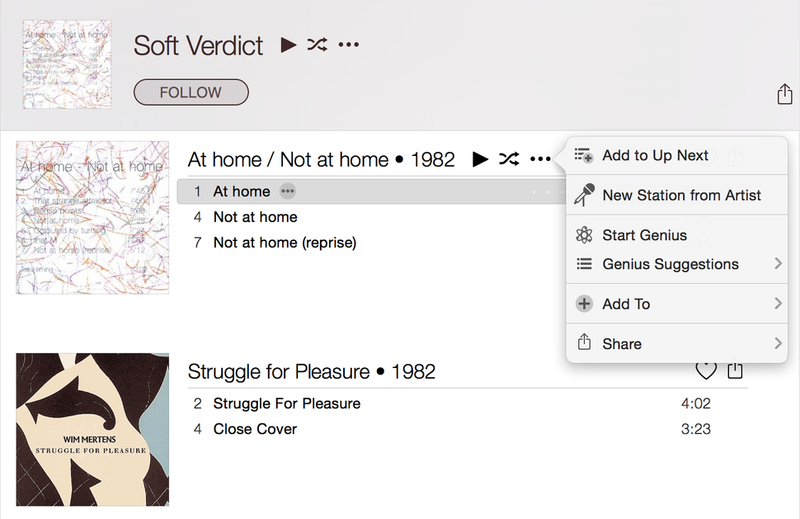 Navigating iTunes used to be a one-click process; now it takes multiple clicks to get where you want. And where is Apple Music? There’s no Apple Music button, but four buttons that are all part of Apple Music. iTunes has lots of different menus. Not just the ones in the menubar, but menus that display in the app’s window. There’s the standard contextual menu, which pops up when you right-click or Control-click an item. And there’s the other contextual menu that displays when you click a “...” button after an item. Some of the menu items are the same in both menus, and some are different. 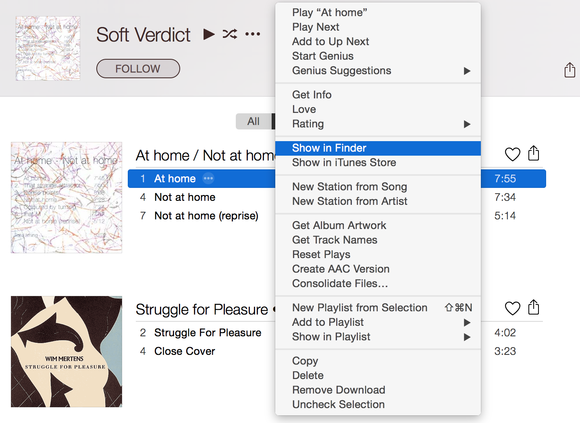 And there’s a different one if you click the “...” button in the iTunes LCD at the top of the window, which is slightly different from the menu that displays when you click the “...” button next to a track name. Don’t get me wrong; many of these features are useful. But it seems more logical to have just one kind of contextual menu, or, if there really need to be two, to have the same menu items in each version. A contextual menu is designed to be different depending on what you’re doing, or what you’re viewing (its context), but in iTunes, menus activated in the same location have different features. But it’s the niggling, weird things that annoy the most. Why can’t you play Beats 1 Radio over AirPlay? How come when you “love” songs in Apple Music, you can’t see a list of those songs anywhere? 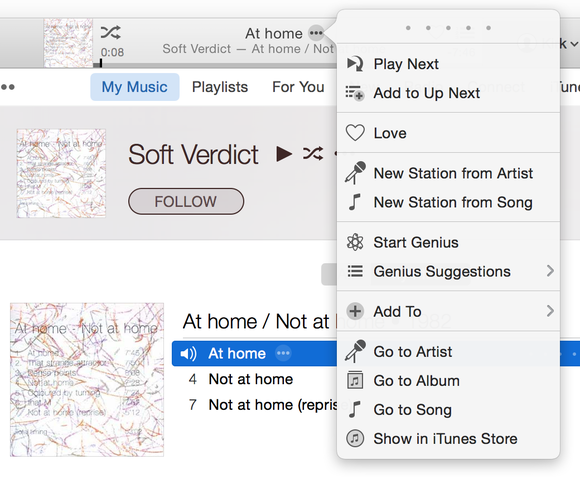 What if you want to buy a song you’ve heard on Apple Music; why isn’t there a Buy button? You have to find the contextual menu, choose Show in iTunes Store, turn around, spit three times, and then you can buy the song. Sharing playlists from Apple Music is a great idea. You need to know what the Sharing button does, and, after that, it’s not too hard. Except if you want to share with someone on OS X. Clicking the shared link doesn’t work reliably. Or did I click it wrong? And if you click a web link to a song, and want to add it to your Apple Music library, or simply listen to it, you can’t; you have to manually search for it in Apple Music. Recent versions of iTunes seem to be designed by the marketing department, not the UI team. In an attempt to stuff as many money-making features as possible into iTunes, Apple has forgotten the app’s original vocation: to play music. iTunes is no longer an app that manages your iTunes library, syncs it to your iOS device, and lets you boogie. It’s become an app to sell, sell, sell you Apple’s media services. A friend recently asked me why he couldn’t save an Apple Music playlist without turning on iCloud Music Library. I understand the need to have a sync system, to keep track of all the music you add to your library, but he didn’t want to turn on iCloud Music Library, and I don’t blame him. iTunes says you can use Apple Music without using iCloud Music Library, but apparently you can’t do much with it. (Don’t even get me started on how badly iCloud Music Library wrecked my music library...) But it shows how much iTunes has turned into a front end for Apple’s cash machines. Me, I’m going to go sync my iPod classic. At least back then, Apple got it right.